"A Romantic View of the Past... Through the Eyes of the Present"
Blending realism, impressionism and fantasy, Bob Pejman's paintings offer a modern look at the ancient ruins of the Mediterranean and Middle East. Fragments of stone temples, majestic villas and overgrown gardens, some of which no longer exist, are painted in direct, clear-cut detail. Pejman relies upon his vivid imagination to rebuild these relics showing the impact centuries of wind, nature and man's own destruction have had upon them. Using bright, contemporary luminescent colors viewers are welcomed into such lush yet forgotten places as Persepolis, Babylon and Pompeii. Pejman spent his early childhood in England and Vienna before settling in the United States in 1976. 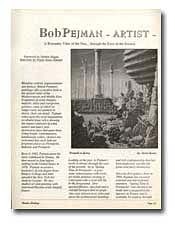 Pejman received a bachelors of arts degree from Rutgers College and later attended the New York Art Students League. He also studied art and painting with renowned Russian artist Anatoly Ivanov. Looking at the past, Pejman's work, is always thought the eyes of the present. As in "Spring Time in Persepolis", a gray-stone ruined palace with worn, yet richly detailed carvings is contrasted with a vivid still life in the foreground. Dew specked flowers, ripe fruit and a colorful bird perched on a grape vine coax viewers in to relax and savor the architectural detailing and rich craftsmanship that has been neglected, just like the great structures themselves. Since his first gallery show in 1994, Pejman has received national and international attention. "Spring time in Persepolis" was chosen to be made into a jacquard loom tapestry in France and is available by catalog through Design Toscano, Chicago. Wall-sized murals are being published by ScanDecor, in Sweden and Modern Art Editions, Nyack, NY is publishing a series of graphics. Pejman's originals and limited editions are available through Pejman Gallery, Short Hills, NJ and Richard Danskin Galleries, Palm Beach, Florida. In the following interview, Pejman offer readers of Heritage Magazine insights into his distinctive style and inspiration. How do you describe your style? What artists have influenced you? I would describe my style as "Romantic Realism." I try to create a romantic mood in my paintings by showing beauty and solitude. The essence of my style is to portray an imaginary setting that a viewer would love to visit, with every spec of its detail. I purposely, refrain from putting people in my paintings. If no one is there, you are free to imagine yourself within the painting. I also deliberately heighten the colors and details of the scenes to make the experience more intense. I am influenced by European artists of the 16th to 19th Centuries. My art is based on a return to the standards set by these artists which demand the knowledge of composition, perspective, color, three dimensional form, and anatomy. But more specifically, artists such as Alma Ta Dema, Maxfield Parish and Van Huysem have had strong influences on my style. Also, even though I paint in a realistic style, when it comes to the choice of colors to paint the effects and light, shade and atmosphere, I am deeply influenced by impressionistic artists in general. Have you actually been to many of the places that you paint or do you prefer just keeping the subjects you paint a distant fantasy? Most of my paintings to this point have been based on imaginary scenes and setting. A few exceptions are when I use an existing place such as Persepolis as a back drop for a painting. A place such as Babylon, for instance, does not even exist any more. Therefore, to paint the subject matter as I do, being on location is not always an option. Also, part of my aim in painting is to design or create scenery - not merely copy it. I think that a lot of artists can go to historic places, set up their easel and paint. With that kind of approach, all that can be achieved is a rendering of scenery which to me is empty and unimaginative. I am trying to go a step beyond that. Are your paintings of Persepolis partly based on your own nostalgia or Persepolis or based on your interest in the history? My paintings of Persepolis are based on my nostalgic view of Persepolis. Mainly because the ruins remind us of one of the world's greatest civilizations, before that of the Roman empire, which now happens to be neglected in terms of its significance in history. I have talked to many cultured world-travelers recently who all know of such architectural sites as the Acropolis, but think that Persepolis is in Greece also. They are surprised to hear that it is situated in ancient Persia. So part of my nostalgia for Persepolis has to do with now neglected and forgotten this monumental site is today. In my painting "Spring time in Persepolis" I try to portray this feeling. Your scenes and stylistic influences are very European. What, if any, influences does Persian art have on your paintings? I paint in a classical European style because I feel that this style enables me best in expressing myself by manipulating a two dimensional surface to create the illusion of three dimensions. But I think that my exposure to Persian art throughout my life has influenced my designs and choice of colors. I use a great deal of jewel tones in my paintings, especially in my still life paintings. So, while y style may be 17th to 19th Century European, the colors I use are more representative of the ones you find in a Persian carpet. What are the artistic roots in your family? Did you grow up around art, and what inspired you as a kid? Both of my parents are musicians. When I was growing up as a kid, my father was composing ballets, operas and motion picture soundtracks and my mother played the harp in the Vienna Philharmonic. So, I was surrounded by Classical music while growing up. That exposure inspired me to be creative both in art and music. When I was in High School, I composed a few orchestral pieces that were performed by the school orchestra and marching band and produced a record. But eventually I came to the realization that my painting skills and talents far outweighed by musical abilities. So I decided to stick with playing the piano just for relaxation while concentrating my remaining efforts on the art business and painting. When did you start painting and when did you discover your talent? I started to paint when I was seven years old. Even the I used a great deal of detail in my painting. In high school I produced a number of significant paintings on canvas and won a few awards. But despite my art instructor's advice, I decided not to enter the art field. Instead, I pursued an education and a career in business and computer software. So, for a period of nine years after graduating from high school I did not touch a paint brush. But some how faith led me to open up an art gallery as a family business which in turn sparked my interest in painting again. Since them, I have attended the New York Art Students League on a part-time basis and studied with two world renowned Russian artists: Anatoly Ivanov and Ovanes Berberian. You say your paintings are often based on history. What do like about the past? Everything that we see today is based on the past. The Greek, Persian and Roman civilizations created architectural designs that we use today for virtually every site we build. Also, in terms of fine arts, the Europeans developed the art of painting, sculpture and music to perfection in the Seventeenth to Nineteenth Centuries. I believe that the combination of technical ability and aesthetic awareness enjoyed by the artists of that era has not and will never be equaled. So, everything that is to come from now on is a derivative of the past, this making it very difficult to create a truly unique style today. That is why so many Twentieth Century artists are celebrated, not on the quality of their work, but for their uniqueness. Do you also find beauty in the present and what is modern? Of course. I very much enjoy living in the modern world. I actually mankind has never had it this good. Most people take for granted how technology and modern medicine have made our lives more enjoyable than ever before. I also admire certain modern architecture and furniture. However, when it comes to the fine arts, with certain exceptions, I think that there is a great deal of junk that is referred to as art today. I believe that even if you want to be an abstract painter today, you still have to study the basics and be able to paint a classical composition before you start splashing paint on the canvas. When you study the careers of artists like Picasso or DeKooning, you will find that their early works were very classical. Later, they decided to break away from the technical boundaries, and that is what gives merit to their modern art. Your paintings allow us to travel in time and space. Are they also a way for you to escape to those places? Do you personally dream of living another place and era? In some way, my paintings do allow me to escape to these places. Another way of putting it is that my paintings reflect my dreams of the ideal places for me to visit. But the key words here are "escape" and "visit." I prefer living in the present. Your art work shows that you have a very romantic nature, sensitivity to detail and nature, and a poetic imagination that borders as mystical and yet you also have a very pragmatic business side that allows you to sell your work. Have both of these very different sides always been a part of your personality? I think that I have always possessed these two different sides. In my paintings I try to focus on the positive and show my appreciation for the beauty in the world by being poetic and sensitive. But, I still have to be able to sell my work. I don't think of these two different sides as opposing, but rather complimentary. Today, in the midst of fierce competition in the art market, it is very difficult to stand out and be successful. As an artist you have to know exactly what the market wants, and be able to produce works that fall in the mainstream while maintaining uniqueness and originality. My aim in painting is to produce works that are unique, artistic, sophisticated and in the meantime appealing to the public. But wouldn't that make your work commercial? "Commercial" is a tricky word! Would you think of Monet's work as commercial? Probably not. After all, they are in major museums and sell in auctions for millions of dollars. However, today, in the commercial poster market, Monet's posters outsell any other artist's. Does that make his work commercial? There is a misconception out there today that if you are a commercial artist, meaning that you paint for the market, then you are not a true artist. That is partially because there is so much junk commercial art in the market today. But if you go back in history, some of the greatest art works were commissioned. Michaelangelo, for instance, was commissioned by the Medici family while Boucher was commissioned by the French aristocracy. As a matter of fact, most of the world's masterpieces in the history of art were created by artists who were supported by and painted for the wealthy. So, I think it is very hard to separate art and the art market. But, you don't have to sacrifice the quality and artistic nature of your work when you paint commercially. It is very difficult but possible. Now let's look at the flip side of this: An artist paints what his heart desires without giving any thought to its demand. If no one likes his art enough to buy it...then, what value do you put on the art besides self appreciation for the artist crates works for other people to enjoy. If he is not able to move the viewer or stir some emotion, then he hasn't done his job. You mentioned uniqueness. What do you think makes your art unique? When you look at the individual elements in my works, you find nothing unique. But, yet the overall works are very recognizable and are not mistaken for any other artist. I believe that I achieve uniqueness by the way I combine these different elements in conjunction with my use of color. For example, I use floral and fruit still lifes in my paintings which have a great deal of 17th Century Dutch Flemish influence. But if you look at the Dutch Flemish works, you find that a floral still life composition is only about the still life and is usually in a very dark and morbid setting. In my paintings I make use of these highly developed Dutch still lifes, but put them in a sunny and architectural setting. Also, in terms of the use of light and shadow, I employ colors of a completely different style and era: Impressionism. So even though the elements are very classical, the paintings look somewhat contemporary. As we approach the third millennium, do you see any trends developing that may effect the acceptability of your work? Looking at the last two decades of the Twentieth Century, it is very interesting to see how the popularity and rise of abstract art cam to a screeching halt by the end of the 80s. The 90s marked a return to Classical, traditional and representational art. I am not saying that abstract art is out but I do believe that it has and will continue to lose ground to Classical art for some time to come. Take the prominent Victorian artist Alma Tadema, whose works were selling for up to 30,000 British Pounds in the late Nineteenth Century. In the 1960s, when abstract was thought to have replaced Classical art permanently, galleries were dumping his masterpieces in the $price range. However, recently, two of his pieces fetched $2.7 million and $2.5 million at Sotheby's and Christie's auctions. There is a revival or renaissance of classical art and architecture which is well underway and I find it interesting that as we are approaching the year 2000, in the information age, we have made a full circle back to the classics. And as for my paintings, I feel that the timing couldn't be any better.